Why do you think Margaret Thatcher as a figure still sparks so much debate? Whether you loved her or hated her, there was something about Mrs. Thatcher that caught the imagination. As a woman, she looked and sounded very different to any previous party leader. She had an abrasive political style and a very clear sense of what was right and wrong. In her view, there were rarely two sides to a question: there was the right thing to do, and there were those who were too weak (or ‘wet’) to do it. So right from the start, she roused very strong reactions. And her governments did big things: if you belonged to a trade union, or bought a council house, or ran a small business, or worked down the mine, the Thatcher governments really mattered to you personally. For better or worse, Britain changed dramatically in the 1980s: when we talk about the financial crisis, or the EU, or public services, we’re partly arguing about Thatcher’s legacy and the implications of her time in power. Regarding Thatcher’s place in history, how much emphasis can be placed on her gender? Margaret Thatcher will go down in history as the first woman to become Prime Minister. She is still the only woman to have led a major political party in Britain, and that affected not just how she was seen but how she governed. As a woman, she had never done military service; she hadn’t been to public school; and she was barred from the clubs and bars where politicians made their contacts. She was neither an officer nor a gentleman, so she had to create her own model of leadership in a very masculine political environment. She could adopt a variety of different personas: to one audience, she was ‘the Iron Lady of the West’; to another, a wife and mother, who ran the national finances like a household budget. But Mrs Thatcher’s historical importance shouldn’t be reduced to her gender. She disliked being described as ‘the first woman Prime Minister’, and was just as proud of being the first trained scientist in Number Ten. As someone who grew up in the 1980s, I’ve always been fascinated by the Thatcher era. One of my earliest memories is of seeing the fleet come back from the Falklands War, and I can remember the power-cuts during the miners strike. The charts were full of songs about Mrs Thatcher – by Elvis Costello, The Beat, The Notsensibles, Morrissey – and I used to watch Spitting Image with its amazing Thatcher puppets. Now that I have to teach this period to students born in the ’90s, I wanted to try to reconnect the Thatcher era to the larger history of the twentieth century – to think about where Thatcherism really came from, how much changed and what kind of legacy it left behind. …undergraduates today were born in the 90s: they have no memory of any prime minister before Tony Blair. To them, Mrs Thatcher is simply a historical figure, so that challenges us to think about how we teach and research the Thatcher era as a ‘historical’ subject. Firstly, you have to be careful not to get swept up in the mythology – whether positive or negative. Not everything that happened in the 80s was Margaret Thatcher’s doing; this wasn’t a one-woman government, and it was often at the mercy of events. Contrary to popular myth, she could and did change her mind, and she didn’t always get her own way. Secondly, when you’re writing about very recent history you have to keep reminding yourself of the things that have changed. The 1980s weren’t so very long ago, but in so many ways it was a different world: the Cold War was in full swing, Germany was still divided and the Cabinet was nearly assassinated by the IRA. It can be hard to recapture those differences for a period that’s still so recent. Thirdly, you have to be careful not to treat ‘the Thatcher era’ as a single entity. “Thatcherism” changed over time. The challenges of the third term were different to the first. Life in “Thatcher’s Britain” could be very different depending on where you lived or what you did for a living. Have you got any recommendations for further reading? Specialised libraries/collections? What is your ‘Desert Island’ book? Possibly “The Remains of the Day” by Kazuo Ishiguro (Faber and Faber, 1989). The best politics book I’ve read recently was Steve Richards’ book on Gordon Brown, “Whatever it Takes” (Fourth Estate, 2010). A superb book that tries to go beyond the personality clash between Blair and Brown. Why do you think that Margaret Thatcher’s reign has not previously been written about in a historical context? It’s partly a question of access: under the thirty year rule, documents from the 1970s and 1980s have only recently been opened to the public. But it’s also because “Thatcher” and “Thatcherism” have been so much a part of contemporary politics since the 1980s. Everyone had a position on Mrs Thatcher, and was engaged in a contemporary political argument. But undergraduates today were born in the 90s: they have no memory of any prime minister before Tony Blair. To them, Mrs Thatcher is simply a historical figure, so that challenges us to think about how we teach and research the Thatcher era as a ‘historical’ subject. If you had to ‘sell’ your book to Margaret Thatcher, how would you do it? Mrs Thatcher was a great believer in good housekeeping, so I’d point out what a bargain it is in paperback! More seriously: I’d say that it’s a scholarly attempt, twenty years after she left office, to assess her place in British history. Mrs Thatcher always believed that she would be vindicated by history – that her governments would change Britain over the long term, not just during their time in office. I hope she would be interested in an attempt, twenty years later, to view her record in a larger historical perspective. 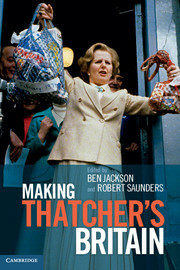 Dr Robert Saunders is the co-editor of ‘Making Thatcher’s Britain’ (out now). He is a Lecturer in History and Politics at Oxford University.